Now let’s talk about the pathways for Six Sigma. First, let me share with you the origin of the name “Six Sigma”. The idea behind the name of Six Sigma is that we want to be able to fit six standard deviations of data between the lower limit we would accept for the data and the upper limit we would accept for the data. In other words, we take a process that usually functions with 0 or 1 standard deviations between the lowest and highest value (most systems) and attempt to make the process much more likely to deliver a good result by creating a situation where six standard deviations of data fit between the upper and lower specification limit. This will become much more clear as we go on. For now just know that the term Six Sigma refers to the level of quality we are trying to achieve. Next, take a minute and realize that Six Sigma takes existing statistical tools and puts these together in a meaningful way to achieve this outcome. Six Sigma is nothing magical or revolutionary in terms of methodology. It simply takes known tools that we could use by themselves and puts these together in a much more meaningful way. So, to my healthcare colleagues: don’t worry, Six Sigma is just the same old statistics you’ve seen elsewhere coupled with a methodology to apply these to what we do. The system also sets up the pre-condition for us to all be on the same page with these useful tools and it allows to draw similar conclusions from similar data. It should be at least mentioned here that Six Sigma evolved in a unique environment. We won’t go into the history too much in this text but you probably know post World War II Japan went through a rebuilding stage. American quality gurus went to Japan and were able to use the latest in management methods to help rebuild the organizational culture. The focus on quantitative tools for management with a data driven culture really resonated with the local environment and over time this set of tools emerged as a slick, packaged system called Six Sigma. Motorola is one of the most well known progenitors of Six Sigma and clarified the process greatly. What are the processes of six sigma? There are two. The first is DMAIC, the next is DMADV. Each of these is usually pronounced as word “dah-may-ick” and “dah-mad-vee”. This is a portion of the many acronyms and specialized language of Lean and Six Sigma that we’ll see as we walk through these processes. In this section, we’ll focus on DMAIC. 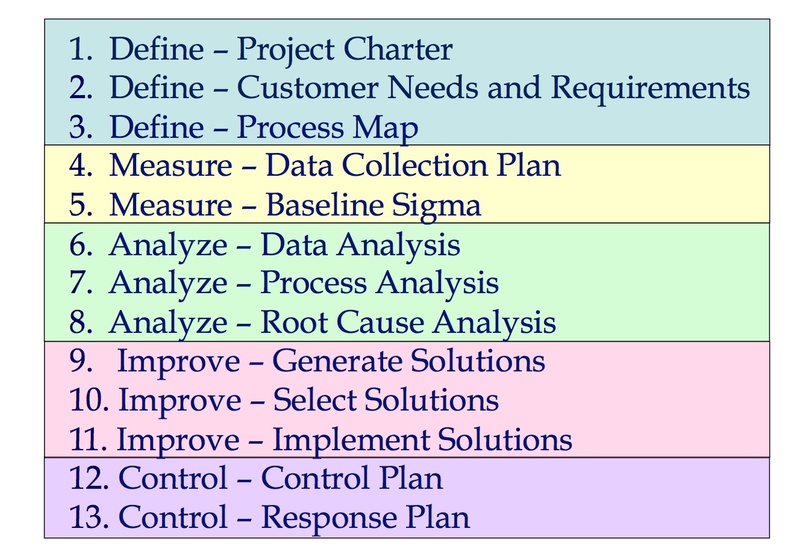 DMAIC is the system utilized to improve processes. The acronym standards for Define, Measure, Analyze, Improve, and Control. Each represents an important step in the pathway to improving a process, and each step has certain checkpoints which we call tollgates that must be satisfied before progressing to the next step. Let’s discuss each. As we work our way through each tollgate and step, keep in mind that we haven’t discussed how to choose a project or pathway to improve. There are many tools and criteria you can use to select which system you want to improve, and DMAIC are those steps to use once you’ve identified the target system. The D in DMAIC, as mentioned, stands for Define. The Define phase has many important tollgates as shown beneath, and the first of these is the project charter. The project charter is a tool that defines the scope of the project involved, the stakeholders (team members for the project from throughout organization) who have a role in its completion, the timeline for completion, and the expected cost savings in terms of the Cost of Poor Quality (COPQ) that will be recouped. For more information on the COPQ, look here. The next tollgate in the Define phase focuses the team on customer needs and requirements. As usual in healthcare, we are faced with determining who exactly the customer is. Is it the patient receiving the care? Is it the third party payor who reimburses the health system? Both? It is at this point in the Define phase that the customer(s) of the process being quantified is identified, and the customer’s voice is made visible as the Voice of the Customer (VOC). As mentioned previously this can be very challenging but is central to the Six Sigma system. The VOC is often used to determine the limits into which the system must fit. In other words, if customers won’t accept, for some reason, waiting times more than 30 minutes then 30 minutes is the VOC and represents the upper limit for wait times. Anything greater than that is a defect. Sometimes, of course, the VOC can come from state regulatory bodies, JCAHO, or another accrediting body. If an accrediting body was going to review a trauma center and published “trauma surgeons must be present within 15 minutes of patient arrival in the trauma bay” then that can be taken as a VOC and any arrival times greater than 15 minutes may be treated as defects. Yes, they may be reasons which are perfectly valid for arrival time greater than 15 minutes, and the magic of Six Sigma is that it makes us look at how things lined up to get the situation where the surgeon arrives beyond 15 minutes…and it does it without pointing fingers or naming names. The next toll gate in the defined phase is the process map. The process map, sometimes called a SIPOC diagram, helps us formalize what each step of the process is and eventually how we will obtain data. This high-level map includes information regarding Suppliers, Inputs, Processes, Outputs, & Customers and from there we create the acronym SIPOC. We use the process map to help select what data can and should be measured to characterize the system in the next step of the DMAIC process. Next, in the measure phase, we formulate a data collection plan. This crystallizes how many data points we will need to detect certain size changes in the system and sets up a statistically valid study. We decide how and where we will get data, and we focus on a certain number of data elements for each portion of the SIPOC diagram. Next we measure the process and establish a base line sigma level or CPK value. This very clearly tells everyone involved how the system is currently performing. For more information on the CPK visit here. Next is the Analyze phase of the DMAIC pathway and so we focus the team on data analysis. Data analysis uses the statistical tools of Six Sigma and, like the rest of the process, these take special training. What is very useful about Six Sigma is that the participants involved will come to similar valid conclusions given similar data because they share a common body of statistics knowledge and those trained in Lean and Six Sigma know how to use the statistical tests to make valid conclusions. Another tollgate closely follows. A process analysis is performed whereby the process is analyzed for potential manners in which it can be revised in light of data, and a root cause analysis is performed with an Ishikawa diagram to determine what the roots are underlying the current state. At times, a Black Belt or Master Black Belt may utilize a root cause analysis, coupled with a multiple regression, earlier in the process. One of the tendencies typically seen in the DMAIC pathway is that staff and team members will jump to the Improve phase prior to the Measure and Analyze phase. It is very normal, especially in the West, to think that we know what is wrong with the process because we live with it everyday. How can we ever know anything better than living in the system every day? It’s powerful, intuitive, experiential, and (unfortunately) incorrect in terms of how a system needs improvement. Healthcare colleagues, I’ve been there: we work in a system everyday, are sure we know what’s wrong, and when the Six Sigma project data shows us something unexpected, well, it can’t be right. Then changes are made based on the data and (huh) things improve greatly. Amazing…guess it was right! To climb up on the soapbox for a minute: the power of these Six Sigma processes are that they place a cross-disciplinary team on the same page, they make the current state of performance VERY clear to everyone, they are not pejorative, AND they show a business case for why change is worthwhile. The steps of Six Sigma, in many ways, satisfy all 8 of Kotter’s classic steps for culture change. The DMAIC process even shows us where our every day experience of a system doesn’t line up with data. Isn’t that the power of statistics? To disabuse us when we think we are doing well but we aren’t and to change our minds about the way forward? Next we pass into the Improve phase. The Improve phase has several toll gates including stakeholder generated solutions. The stakeholders generate different solutions based on the now visible and shared data. Again, generating solutions based on the data that are present makes an important difference for not just project outcome but overall quality in the system. Then, solutions are selected from among candidate solutions based on criteria like how easily they maybe implemented, resource expenditure and impact in the system. Solutions are implemented and follow-up data is collected to ensure a significant improvement as demonstrated by statistical testing. Next, importantly, is the control phase of the DMAIC pathway. Once a system has been improved, it is important to have ongoing review of the system and oversight with control. That way, if the system relapses into a poor state of quality, we are aware and can make changes. Tools like individual moving range charts (ImR charts) and similar techniques are useful as we focus on keeping the improved system under control. Finally, a response plan is generated so that when the system does give us the signal that it is having quality issues there is a planned response. Above, we have described the DMAIC pathway for Six Sigma. Remember, the point of this pathway is to promote Six Sigma’s stated goal of achieving six standard deviations of data between the upper and lower spec limit. That may not have much meaning to you now, but it states that Six Sigma seeks to make great improvements in things like defect rates. 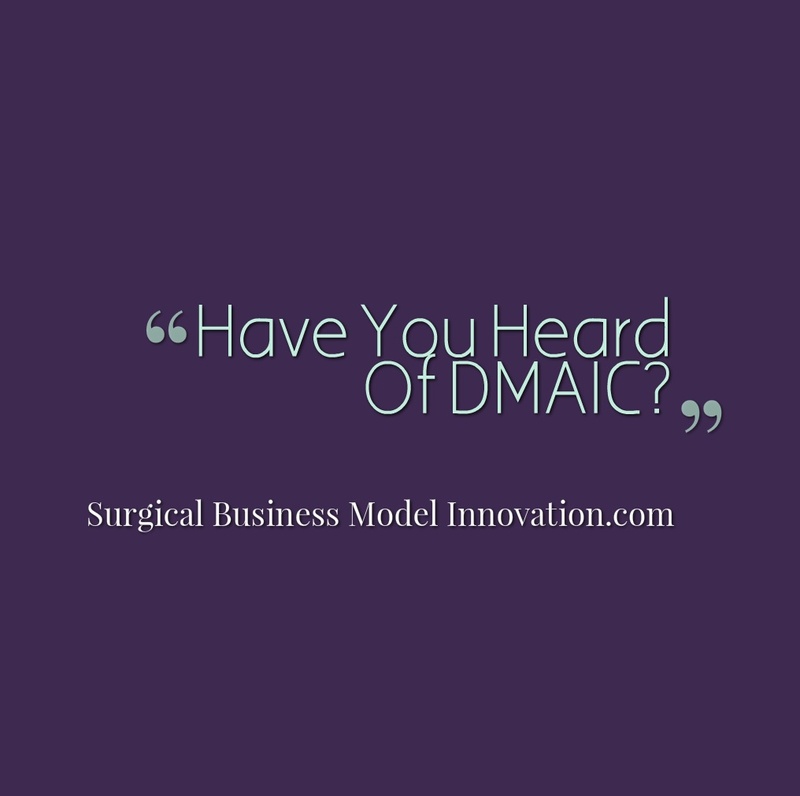 The DMAIC pathway is the overall scheme by which this is performed. You have seen that this is very different than how we typically function in healthcare in that it is highly data-driven and that personally assignable, opinion-based changes are highly discouraged. The saying, in Six Sigma, is that “if you don’t have data you just have an opinion.” The DMAIC pathway has certain tollgates which the team progresses through. These tollgates are steps by which meaningful improvement is achieved and sustained before the final control phase. Clearly the DMAIC pathway is very different than our typical approach to quality control in healthcare, and, as we close this section, let me share with you that it is much more effective.